K.R.Ä.T.Z.Ä. 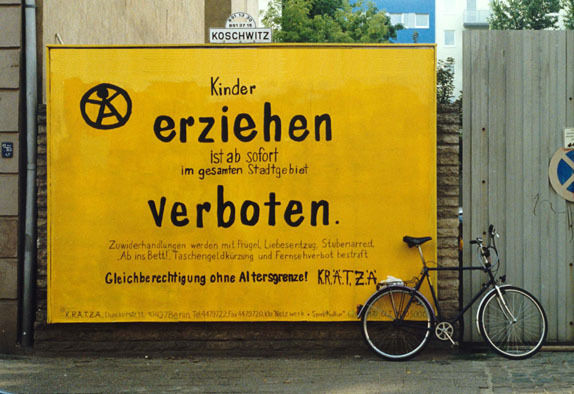 - Family - "No disciplining of children"
Family > "No disciplining of children"
placard and postcard "erziehen verboten"
On July 14th 1997 we designed this poster. For 30 days it could be seen in Lychener Straße in Berlin-Prenzlauer Berg - not far from our office. During the "Sommerloch" - the "silly season", when there is not much happening in politics and the economy and only few poster sites are rented - the Centre for Child Protection was given for free 100 poster sites in the inner city of Berlin to let them be filled by children, young people and artists. In December 1997 a corresponding postcard was published in an edition of 2200. In september 1999 another 2000 copies were printed. "From now on it is prohibited to discipline children anywhere in the entire city. no (or less) pocket-money and not being allowed to watch TV. Equal rights without age limit! K.R.Ä.T.Z.Ä."